At Doggie Latchkey we take our work in pet care very seriously. We’ve gone through a lot of time and trouble to make sure we offer what you need to take excellent care of your pet while you are away, and we’re very proud of that fact. From scheduling to certifications to insurance coverage, we have everything in place to serve you seamlessly. Our services are available 24/7, and we provide easy scheduling! Why use our pet care services? There are many reasons to choose Doggie Latchkey for your pet sitting needs. Here are some of them. • Our pet sitters work together as a team and all clients have a dedicated backup, so you are always covered in case of emergency. • Pets receive complimentary training, including all daily dog walking and puppy care. • All pet sitters have professional and accredited training. • We have the highest level of insurance available in the industry. • We offer simple online scheduling for all services. • You can get updates from your sitter via phone, email or text message. • We offer convenient electronic payment options. • Our company is the best alternative to boarding your pets, and we provide substantial savings for families with multiple pets. • Our overnight pet sits offer the earliest arrival time in the area, and include two complimentary walks. 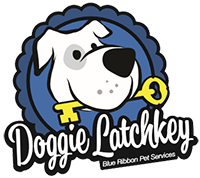 Doggie Latchkey is a fully bonded and insured pet sitting company serving Metro Detroit and Grand Rapids, MI, since 2009. All of our professional pet sitters are bonded for your protection and peace of mind. Our insurance policy goes far above minimum coverage levels and industry standards. It is important to be aware that many liability policies exclude coverage for damage to personal property in care, custody and control. Our insurance and bonding provides our clients with premier in-home pet sitting services. All of our pet-sitters are bonded, which includes an extensive background check for your protection. We will carry proof of bonding and insurance on all initial meet-and-greet visits for your inspection. This proof will always include expiration dates and a phone number you can call to independently verify our coverage. As a professional and responsible business, Doggie Latchkey carries a special policy feature that includes coverage for damage to property in care, custody and control. This includes your pet, as well as your home and the property inside it. Furthermore, it includes coverage for lost keys. Third-party protection is included under our basic liability coverage. Doggie Latchkey is insured through Century Insurance Group, an A-Excellent rated company with A.M. Best. The pet-sitter bonding is an additional protection policy underwritten by Travelers Casualty and Surety Company of America and designed for professional pet sitters. Travelers Casualty and Surety Company of America is rated A+ (Superior) by A.M. Best. Our limited liability insurance also includes a Home Pet Care Endorsement. We are a proud member of Pet Sitters International. View Doggie Latchkey’s “Standards of Excellence in Pet Sitting” as a member of PSI. We are trained in CPR for dogs by Advantage First Aid, a proud provider of American Red Cross Health and Safety Training. All new clients will get a “meet and greet,” where the pet sitter and your pet will get to know one another prior to the first appointment to make sure it’s a good match! Each appointment is done in the client’s home and is complimentary. Set up an appointment with insured professionals!